Loader Breakout Force: 5,961 lbs. Loader Lift Capacity: 3,960 lbs. Loader Max Lift Heigh: 10' 6"
Backhoe Breakout Force: 7,602 lbs. 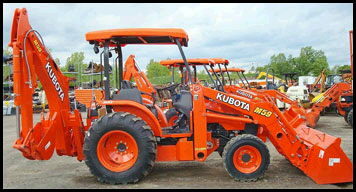 * Please call us with any questions about our kubota m59 tractor loader w/12 foot backhoe rentals in Cincinnati OH and Southeast Clermont County in Ohio.